Looking for soft leather case to carrry and protect your camera? The world’s leading manufacturer of digital cameras, Sony has announced its latest LCS-TWA/T Soft Leather Carrying Case which the company claims to draw envious look with an elegance and understated portfolio design. This leather case is designed for Sony Cybershot T-series and W-series cameras, aiming to keep them safe from bumps and scratches. 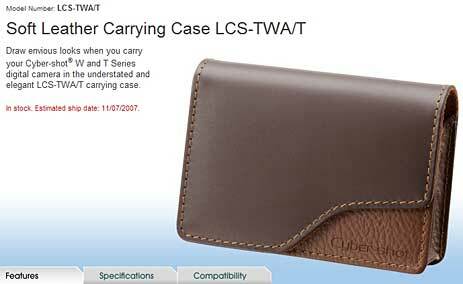 The new and cool Sony LCS-TWA soft leather case which available in brown, black and red colors will hit the markets from November 7th, 2007.